Pensacola, FLA. (November 30, 2016) – On Wednesday, November 30 at 9:30 a.m. 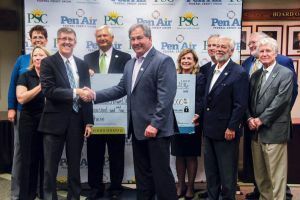 Pen Air Federal Credit Union announced the gift of $100,000 to the Pensacola State College (PSC) Alumni Association Endowed Scholarship Fund. The gift of $100,000 parallels with the celebration of the college now having more than 100,000 PSC graduates as of this December’s commencement ceremony. In partnership with Pensacola State College and the PSC Alumni Association Endowed scholarship initiative, the gift names the Pen Air Federal Credit Union Scholarship Fund, and will be available to area residents who enroll at PSC and meet the qualifications. The gift also names the Pen Air Federal Credit Union Room in the Edward M. Chadbourne Library. The room will host financial literacy classes and seminars to PSC students, Pen Air members and the entire community. About Pensacola State College – Founded in 1948, Pensacola State College enrolls about 26,000 students and offers more than 100 programs leading to bachelor’s degrees, associate degrees, certificates and diplomas. A public state college, PSC is ranked in the Top 1 percent in affordability nationwide and makes the list of Top 100 Associate Degree Producers year after year. The college also is recognized as Military Friendly and Best for Vets. PSC has grown to include campuses in Pensacola, Milton and Warrington, along with centers in Century and South Santa Rosa County. The Downtown Center is headquarters for corporate and professional training programs. About Pen Air Federal Credit Union – At Pen Air Federal Credit Union, respect is a guiding principle. As the largest and oldest credit union headquartered in Pensacola, Florida, with $1.3 billion in assets, Pen Air is dedicated to enhancing lives through exceptional service, strength, and financial solutions. Eighteen locations in Northwest Florida and Southeast Alabama, which include three student-run credit unions at area high schools, combined with Online and Mobile banking provide worldwide reach. Pen Air is a not-for-profit, member-owned financial institution, serving the community and improving lives since 1936. For more information, visit www.penair.org or call (850) 505-3200/toll free (877)4PENAIR.